76. P.B. Chatterjee, O. Goncharov-Zapata, L.L. Quinn, G. Hou, H. Hamaed, R.W. Schurko, T. Polenova* and D.C. Crans*, 2011. Characterization of Noninnocent Metal Complexes Using Solid-State NMR Spectroscopy: o-Dioxolenevanadium Complexes. Inorg. Chem. 50, 9794�03. DOI: 10.1021/ic200046k. 56. Department of Chemistry, Queens� University, Kingston, ON, Nov. 30, 2012. 55. National High Magnetic Field Laboratory, Tallahassee, FL, Nov. 8, 2012. 54. Department of Chemistry, University of Warwick, Coventry, U.K., Oct. 3, 2012. 53. Department of Chemistry, Tata Institute for Fundamental Research, Mumbai, India, Feb. 17, 2012. 52. R.W. Schurko, Department of Chemistry, University of Cambridge, Cambridge, U.K., July 1, 2011. 51. R.W. Schurko, Laboratoire de Cristallochimie et Physicochimie du Solide, Universit� des Sciences et Technologies de Lille, Lille, France, June 30, 2011. 50. R.W. Schurko, Ecole normale sup閞ieure de Lyon, Lyon, France, June 29, 2011. 49. R.W. Schurko, Schulich Faculty of Chemistry, Technion Institute of Technology, Haifa, Israel, March 28, 2011. 48. R.W. Schurko, Dept. of Chemical Physics, Weizmann Institute, Rehovot, Israel, March 24, 2011. 47. R.W. Schurko, Dept. of Chemistry, University of Tel Aviv, Tel Aviv, Israel, March 15, 2011. 46. R.W. Schurko, Dept. of Chemistry, St. Mary抯 University, Halifax, NS, February 11, 2011. 45. R.W. Schurko, Dept. of Chemistry, University of Toronto at Mississauga, Mississauga, ON, January 25, 2011. 44. R.W. Schurko, Department of Chemistry, University of California at Riverside, Riverside, CA, February 10, 2010. 43. R.W. Schurko, Department of Chemistry, University of California at Irvine, Irvine, CA, February 9, 2010. 42. R.W. Schurko, Department of Chemistry, McGill University, Montreal, QC, October 12, 2009. 41. R.W. Schurko, Schulich Faculty of Chemistry, Technion Israel Institute of Technology, Haifa, Israel, June 25, 2009. 40. R.W. Schurko, Department of Chemical Physics, Weizmann Instititute, Rehovot, Israel, June 18, 2009. 39. R.W. Schurko, Department of Chemistry, State University of New York at Buffalo, Buffalo, NY, April 3, 2009. 38. R.W. Schurko, Department of Chemistry & Biochemistry, Concordia University, Montreal, QC, October 31, 2008. 37. R.W. Schurko, Department of Chemistry, University of Iowa, Iowa City, IA, October 20, 2008. 36. R.W. Schurko, Department of Chemistry, Iowa State University, Ames, IA, October 17, 2008. 35. R.W. Schurko, Department of Chemistry, University of Galway, Galway, Ireland, April 28, 2008. Ibid. 34. R.W. Schurko, Department of Chemistry, University of Glasgow, Glasgow, Scotland, April 22, 2008. Ibid. 33. R.W. Schurko, Department of Chemistry, University of St. Andrews, St. Andrews, Scotland, April 17, 2008. Ibid. 31. R.W. Schurko, Department of Physics, University of Warwick, Coventry, England, April 1, 2008. Ibid. 30. R.W. Schurko, Department of Chemistry, University of Guelph, Guelph, ON, January 24, 2007. Seeing the "invisble" nucleus: Ultra-wideline NMR spectroscopy. 29. R.W. Schurko, Department of Chemistry, Washington University, St. Louis, MO, November 9, 2007. Techniques for observing unreceptive quadrupolar nuclei in solid state NMR. 28. R.W. Schurko, D閜artement de Chimie, Universit� Laval, Laval, QC, October 24, 2007. Nanoparticle Cores and Surfaces: Insights from Multinuclear Solid-State NMR. 27. R.W. Schurko, Department of Chemistry, Carleton University, Ottawa, ON, October 1, 2007. Solid State NMR Across the Periodic Table. 26. R.W. Schurko, Laboratoire de Cristallochimie et Physicochimie du Solide, Universit� des Sciences et Technologies de Lille, Lille, France, April 18, 2007. Ibid. 25. R.W. Schurko, Laboratoire de Structure et Dynamique par R閟onance Magn閠ique, Commissariat � l'Energie Atomique (CEA), Saclay (Paris), France. April 17, 2007. Ibid. 24. R.W. Schurko, 蒫ole Sup閞ieure Chimie Physique 蒷ectronique de Lyon, Lyon, France, April 10, 2007. Ibid. 23. R.W. Schurko, Commissariat � l'蒼ergie Atomique (CEA), Grenoble, France, April 3, 2007. Ibid. 22. R.W. Schurko, Ecole normale sup閞ieure de Lyon, Lyon, France, March 27, 2007. NMR Spectroscopy Across the Periodic Table: Applications to Solid & Organometallic and Inorganic Materials. 21. R.W. Schurko, Mount Allison University, February 15, 2007. NMR Spectroscopy Across the Periodic Table: Applications to Solid & Organometallic and Inorganic Materials. 20. R.W. Schurko, St. Francis Xavier University, February 13, 2007. NMR Spectroscopy Across the Periodic Table: Applications to Solid & Organometallic and Inorganic Materials. 19. R.W. Schurko, Clark University, October 20, 2006. NMR Spectroscopy Across the Periodic Table: Applications to Solid & Organometallic and Inorganic Materials. 18. R.W. Schurko, University of Akron, September 19, 2006. Solid State NMR Across the Periodic Table: Applications to Inorganic & Organometallic Materials. 17. R.W. Schurko, University of Victoria, January 30, 2006. Observing the 揑nvisible� Nucleus: NMR of unreceptive nuclei in inorganic, organometallic and other solid materials. 16. R.W. Schurko, Simon Fraser University, January 25, 2006. Observing the 揑nvisible� Nucleus: NMR of unreceptive nuclei in inorganic, organometallic and other solid materials. 15. R.W. Schurko. National Research Council, Ottawa. October 20, 2005. NMR of unreceptive nuclei in solid materials: developments and applications. 14. R.W. Schurko. University of Western Ontario, October 5, 2005. Solid-state NMR across the periodic table: Applications to organometallic and inorganic materials. 13. R.W. Schurko. University of Ottawa, September 16, 2005. Solid-State NMR across the periodic table: Applications to organometallic and inorganic materials. 12. R.W. Schurko. Michigan State University, Sept. 27, 2004. Solid-State NMR of Quadrupolar Nuclei in Organometallic Complexes, Mesoporous Composite Materials & Nanoparticles, a talk by R.W. Schurko. 11. R.W. Schurko. University of Manitoba, Sept. 17, 2004. Solid-State NMR of Quadrupolar Nuclei in Organometallic Complexes, Mesoporous Composite Materials & Nanoparticles, a talk by R.W. Schurko. 10. R.W. Schurko. University of Michigan, Sept. 14, 2004. Solid-State NMR of Quadrupolar Nuclei in Organometallic Complexes, Mesoporous Composite Materials & Nanoparticles, a talk by R.W. Schurko. 9. R.W. Schurko. Stockholm University, Jun 18, 2004, Stockholm, Sweden. Probing Structure and Dynamics in Organometallic Complexes and Mesoporous Composite Materials with Solid-State NMR, a talk by R.W. Schurko. 8. R.W. Schurko. University of Calgary, March 5, 2004, Calgary, Alberta, Canada. Solid-State NMR of Quadrupolar Nuclei in Metallocenes, a talk by R.W. Schurko. 7. R.W. Schurko. University of Alberta, March 3, 2004, Edmonton, Alberta, Canada. Solid-State NMR of Quadrupolar Nuclei in Metallocenes, a talk by R.W. Schurko. 6. R.W. Schurko. University of Lethbridge, March 1, 2004, Lethbridge, Alberta, Canada. Solid-State NMR of Quadrupolar Nuclei in Metallocenes, a talk by R.W. Schurko. 5. R.W. Schurko, The Ohio State University, November 25, 2003, Columbus, OH, USA. Solid-State NMR of the Hearts of Metallocenes: New Information from NMR of Metal Nuclei, a talk by R.W. Schurko. 4. R.W. Schurko. Oakland University, October 15, 2003, Oakland, MI, USA. New Information from Organometallic Compounds via Solid State NMR of Metal Quadrupolar Nuclei, a talk by R.W. Schurko. 3. R.W. Schurko. Wayne State University, September 12, 2002, Detroit, MI, USA. Solid-State NMR Studies of Metallocenes: Tuneable Electronic Environments for Metal Quadrupolar Nuclei, a talk by R.W. Schurko. 2. R.W. Schurko. University of Michigan, October 2, 2001. Investigation of Symmetry, Structure and Dynamics by Solid-State NMR of Quadrupolar Nuclei. L147. K.E. Johnston, C.A. O扠eefe, A.J. Rossini, M.P. Hildebrand, L.A. O扗ell, K.J. Harris, A. Lipton, I. Hung, C. Coperet, R. Gauvin, L. Delevoye and R.W. Schurko. Probing the molecular structures of catalysts via SSNMR of metal and halogen nuclei. Energy@MagLab Workshop 2012, Tallahassee, FL, Nov. 7-8, 2012. Invited Lecture. L146. A.M. Namespetra, A. Sandre, M. Hildebrand, H. Hamaed, J. Donohue, Z. Gan, I. Hung and R.W. Schurko. Screening HCl Pharmaceuticals: Differentiation of Polymorphic Forms in Bulk Solids and Dosage Forms by 35Cl SSNMR. 25th MOOT NMR Symposium, Quebec City, QC, Oct. 20-12, 2012. P145. A.M. Namespetra, A. Sandre, M. Hildebrand, H. Hamaed, J. Donohue, Z. Gan, I. Hung and R.W. Schurko. 35Cl Solid-State NMR of Active Pharmaceutical Ingredients: Pure Samples, Polymorphs and Pills. Small Molecule NMR Conference (SMASH), Providence, RI, September 9th - 12th, 2012. L144. K. E. Johnston, C. A. O'Keefe and R. W. Schurko. A Study of Transition-Metal Organometallic Complexes using 35Cl SSNMR, 35Cl NQR and First-Principles DFT Calculations. 54th Annual Rocky Mountain Conference on Analytical Chemistry, Copper Mountain, CO, July 15-19, 2012. P143. S.L. Veinberg, Z.W. Friedl, C.R. Mireault, K.J. Harris, L.A. O扗ell and R.W. Schurko. 14N Solid-State NMR of Organic and Biological Molecules: Experimental Considerations and Applications. 54th Annual Rocky Mountain Conference on Analytical Chemistry, Copper Mountain, CO, July 15-19, 2012. L142. K.J. Harris, V.N. Vukotic, K. Zhu, S.J. Loeb and R.W. Schurko. Using SSNMR to Characterize the Motion of Molecules Interlocked on the 3D Array of a Metal-Organic Framework. 95th Canadian Chemistry Conference and Exhibition, Calgary, AB, Canada, May 26-30, 2012. Invited Lecture. L141. K.J. Harris, B.E.G. Lucier, S.L. Veinberg, A. Lupulescu, L. Frydman and R.W. Schurko. New Developments in Using Adiabatic Pulses for Broadband Cross Polarization: Observing Quadrupolar Spins and Making Use of z-Storage. 95th Canadian Chemistry Conference and Exhibition, Calgary, AB, Canada, May 26-30, 2012. L140. B.E.G. Lucier, J.-L. Lemyre, A.M. Ritcey and R.W. Schurko. Multinuclear SSNMR of Octahedral YF3 Nanoparticles. 95th Canadian Chemistry Conference and Exhibition, Calgary, AB, Canada, May 26-30, 2012. P139. B.E.G. Lucier, A.R. Reidel, K.J. Harris, K.E. Johnston, J. Autschbach, and R.W. Schurko Recent advances in Ultra-Wideline 195Pt SSNMR. 95th Canadian Chemistry Conference and Exhibition, Calgary, AB, Canada, May 26-30, 2012. P138. A.M. Namespetra, M.P. Hildebrand, I. Hung, Z. Gan and R.W. Schurko. 35Cl Solid-State NMR Studies of HCl Pharmaceuticals and their Polymorphs. 95th Canadian Chemistry Conference and Exhibition, Calgary, AB, Canada, May 26-30, 2012. P137. V.N. Vukotic, K.J. Harris, K. Zhu, R.W. Schurko and S.J. Loeb. A Dynamic Metal-Organic Rotaxane Framework. 95th Canadian Chemistry Conference and Exhibition, Calgary, AB, Canada, May 26-30, 2012. L136. B.E.G. Lucier, D.G. Klauke and R.W. Schurko. Solid-State NMR Investigations of 'Stacked' Square-Planar Pt(II) Systems. National Ultrahigh-Field NMR Facility for Solids 7th Annual Solid-State NMR Workshop, Calgary, AB, May 26, 2012. Invited lecture. 135. R.W. Schurko, K.J. Harris, B.E.G. Lucier, A. Lupulescu and L. Frydman. Developing a Fully Broadband Cross-Polarization Experiment using Adiabatic Pulses: Theory and Experiment for the BRAIN-CP Pulse Sequence. 53rd ENC, Miami, FL, April 15-20, 2012. 134. Study of Transition-Metal Organometallic Complexes using 35Cl Solid-State NMR, 35Cl NQR and First-Principles DFT Calculations. K.E. Johnston, C.A. O'Keefe and R.W. Schurko. 53rd ENC, Miami, FL, April 15-20, 2012. 133. B.E.G. Lucier, A.R. Reidel, K.J. Harris, J. Autschbach and R.W. Schurko. Recent Advances in 195Pt Solid-State NMR. 53rd ENC, Miami, FL, April 15-20, 2012. 132. S.L. Veinberg, C.R. Mireault, Z.W. Friedl, K.J. Harris, L.A. O扗ell and R.W. Schurko. New advances in 14N solid-state NMR. 18th National Magnetic Resonance Society Meeting, Bangalore, India, February 5-8, 2012. Invited lecture. 131. K.J. Harris, B.E.G. Lucier, A. Lupulescu, L. Frydman and R.W. Schurko. New Advances in Broadband Cross-Polarization. 2011 Eastern Analytical Symposium and Exposition, Somerset, NJ, November 12-15, 2011. Invited lecture. 130. K.J. Harris, B.E.G. Lucier, A. Lupulescu, L. Frydman and R.W. Schurko. BRAIN‑CP: Using BRoadband Adiabatic INversion for Cross Polarization of Wideline SSNMR Spectra. 24th MOOT NMR Symposium, Toronto, ON, October 22‑23, 2011. 129. S.L. Veinberg, C.R. Mireault, Z.W. Friedl, K.J. Harris, L.A. O扗ell and R.W. Schurko. 14N Solid‑State NMR Spectroscopy by Direct Detection. 24th MOOT NMR Symposium, Toronto, ON, October 22‑23, 2011. 128. K. E. Johnston and R. W Schurko. A study of transition‑metal organometallic complexes using 35Cl NMR, 35Cl NQR and first‑principles DFT calculations. 24th MOOT NMR Symposium, Toronto, Ontario, October 22‑23, 2011. 127. A. Namespetra, M. Hildebrand and R.W. Schurko. 35Cl Solid‑State NMR Studies of HCl Pharmaceutical Polymorphs. 24th MOOT NMR Symposium, Toronto, ON, October 22‑23, 2011. 126. Z. Friedl, S. Veinberg, and R.W. Schurko. A 14N Solid‑State NMR Study of Amino Acids and their Polymorphic Forms. 24th MOOT NMR Symposium, Toronto, ON, October 22‑23, 2011. 125. B.E.G. Lucier, M.D. Roslan, and R.W. Schurko. Solid‑State NMR of Magnus' Green and Pink Salts. 24th MOOT NMR Symposium, Toronto, ON, October 22‑23, 2011. 124. K.J. Harris, L.A. O扗ell, S. Veinberg, C. Mireault, C.I. Ratcliffe, J. Autschbach and R.W. Schurko. Recent Advances in 14N Solid-State NMR. 7th Alpine Conference on Solid-State NMR, Chamonix Mont Blanc, France, Sept. 11-15, 2011. Invited plenary lecture. 123. K.J. Harris, B.E.G. Lucier, R.W. Schurko, A. Lupulescu and L. Frydman. Broadband Excitation in Cross-Polarization Experiments Using Frequency-Stepped Adiabatic Inversion Pulses. 7th Alpine Conference on Solid-State NMR, Chamonix Mont Blanc, France, Sept. 11-15, 2011. 122. M.P. Hildebrand, A.J. Rossini, S.A. Johnson, V. Terskikh and R.W. Schurko. Multinuclear Solid-State NMR Studies of Zirconocene/MAO Polymerization Catalysts. 16th International Symposium on Silicon Chemistry and 43rd Inorganic Discussion Weekend, Niagara Falls, ON, August 19-21, 2011. A lecture presented by M.P. Hildebrand. 121. K.E. Johnston and R.W. Schurko. A Study of Transition-Metal Organometallic Complexes Using 35Cl NMR, 35Cl NQR and First-Principles DFT Calculations. 16th International Symposium on Silicon Chemistry and 43rd Inorganic Discussion Weekend, Niagara Falls, ON, August 19-21, 2011. A lecture presented by K.E. Johnston. 120. R.W. Schurko, K.J. Harris, B.E.G. Lucier, A. Lupescu and L. Frydman. A New Method for Broadband Cross Polarization. Journ閑 RMN Grand Bassin Parisien Ete 2011 de R閟eau RMN Grand Bassin Parisien, Nantes, France, June 20, 2011. Invited lecture. 119. S.L. Veinberg, C.R. Mireault, K.J. Harris, L.A. O扗ell and R.W. Schurko. 14N Solid-State NMR Spectroscopy of Amino Acids and Pharmaceuticals. 94th Canadian Society for Chemistry Conference, Montreal, QC, Canada, June 5-9, 2011, a poster presented by S.L. Veinberg. 118. M.P. Hildebrand, A.J. Rossini, S.A. Johnson and R.W. Schurko. Multinuclear Solid State NMR Studies of Zirconocene/MAO Polymerization Catalysts. 94th Canadian Society for Chemistry Conference, Montreal, QC, Canada, June 5-9, 2011, a poster presented by M.P. Hildebrand. 117. B.E.G. Lucier, M.D. Roslan and R.W. Schurko. A Multinuclear Solid-State NMR Study of Magnus' Green Salt, [Pt(NH3)4][PtCl4]. 94th Canadian Society for Chemistry Conference, Montreal, QC, Canada, June 5-9, 2011, a poster presented by B.E.G. Lucier. 116. B.E.G. Lucier, A.R. Reidel and R.W. Schurko. Multinuclear Solid-State NMR of Cisplatin and Related Systems. 94th Canadian Society for Chemistry Conference, Montreal, QC, Canada, June 5-9, 2011, a lecture presented by B.E.G. Lucier. 115. K.E. Johnston and R.W. Schurko. A Study of Transition-Metal Organometallic Complexes using 35Cl NMR, 35Cl NQR and First-Principles DFT Calculations. 94th Canadian Society for Chemistry Conference, Montreal, QC, Canada, June 5-9, 2011, a lecture presented by K.E. Johnston. 114. K.J. Harris and R.W. Schurko. Exploring Amplitude- and Phase-Encoded Contact Pulses for Improving Cross-Polarization Bandwidth in Solid-State NMR. 94th Canadian Society for Chemistry Conference, Montreal, QC, Canada, June 5-9, 2011, a lecture presented by K.J. Harris. 113. K.E. Johnston and R.W. Schurko. A 35Cl Solid-State NMR Study of Transition-Metal Organometallic Complexes Using Ultra-High Field NMR. National Ultrahigh-Field NMR Facility 6th Annual Solid-State NMR Workshop, June 5, 2011, Montreal, QC, Canada, a lecture presented by K.E. Johnston. Invited lecture. 112. A.J. Rossini, M.P. Hildebrand, K.E. Johnston, A.S. Lipton, F. Rascon, C. Coperet and R.W. Schurko. Solid-State NMR of Metals and Halogens in Heterogeneous Catalysts, Co-catalysts and Catalytic Precursors. 52nd Experimental NMR Conference, Pacific Grove, CA, April 10-15, 2011, a poster presented by R.W. Schurko. 111. Luke O'Dell, R.W Schurko, K.J. Harris, J. Autschbach and C. Ratcliffe. Molecular Dynamics and Relaxation Effects in Ultra-Wideline 14N Solid-State NMR. 52nd Experimental NMR Conference, Pacific Grove, CA, April 10-15, 2011, a poster presented by Luke O扗ell. 110. L.A. O'Dell, K.J. Harris, S. Veinberg, C. Mireault, B.E.G. Lucier and R.W. Schurko. New advances in 14N solid-state NMR. MOOT XXIII NMR Symposium, Halifax, NS, October 16-17, 2010, a lecture presented by Rob Schurko. 109. A.J. Rossini, M.P. Hildebrand, R.W. Schurko and P.W. Hazendonk. Characterization of Microencapsulated Scandium Complexes by Multi-nuclear Solid-State NMR. 52nd Rocky Mountain Conference on Analytical Chemistry, Snowmass CO, Aug. 1-5, 2010, a poster presented by Rob Schurko. 108. L.A. O扗ell, R.W. Schurko, K.J. Harris, J. Autschbach and C.I. Ratcliffe. Ultra-wideline 14N NMR as a Probe of Molecular Structure and Dynamics. 52nd Rocky Mountain Conference on Analytical Chemistry, Snowmass CO, Aug. 1-5, 2010, a poster presented by Luke O扗ell. 107. K.J. Harris, B.E.G. Lucier, Z.M. Hudson, C. Sun, S. Wang, and R.W. Schurko. Probing the Structural Origins of Vapochromism in Pt(di-t-butyl-bipyridyl)(CC-C6H4-BMes2)2 - a 195Pt, 13C, 11B, 2H and 1H Multinuclear Solid-state NMR Study. 52nd Rocky Mountain Conference on Analytical Chemistry, Snowmass CO, Aug. 1-5, 2010, a poster presented by Kris Harris. 106. R.W. Schurko, H. Hamaed, K.J. Harris, B.E.G. Lucier, A.W. MacGregor, L.A. O'Dell and A.J. Rossini. New Advances in Ultra-Wideline Solid-State NMR Spectroscopy. 93rd Canadian Society for Chemistry Conference, Toronto, ON, May 29 - June 2, 2010, a lecture presented by Robert Schurko. Invited lecture. 105. H. Hamaed H., B.F.T. Cooper, E. Ye, V.V. Terskikh, C.L.B. Macdonald and R.W. Schurko. Solid-State 115In NMR of Indium Low-Oxidation State Complexes. 93rd Canadian Society for Chemistry Conference, Toronto, ON, May 29 - June 2, 2010, a lecture presented by Hiyam Hamaed. 104. A.J. Rossini, M.P. Hildebrand, R.W. Schurko and P.W. Hazendonk. Multinuclear Solid-State NMR Studies of Microencapsulated Scandium Catalysts. 93rd Canadian Society for Chemistry Conference, Toronto, ON, May 29 - June 2, 2010, a lecture presented by Aaron Rossini. 103. K.J. Harris, C. Mireault and R.W. Schurko. The Utilization of Frequency-Swept Echo Pulse Sequences for Bandwidth Improvement in Wideline Solid-State NMR Spectra. 93rd Canadian Society for Chemistry Conference, Toronto, ON, May 29 - June 2, 2010, a poster presented by Kris Harris. 102. B.E.G. Lucier, J. Lemyre, A.M. Ritcey and R.W. Schurko. Multinuclear Solid-State NMR of Octahedral YF3 Nanoparticles. 93rd Canadian Society for Chemistry Conference, Toronto, ON, May 29 - June 2, 2010, a poster presented by Bryan Lucier. 101. Solid-State NMR of Inorganic Systems: Molecules, Networks and Nanoparticles studied via 19F, 45Sc, 35Cl, 65Cu, 89Y, 91Zr, 109Ag, 115In, 119Sn, 195Pt, 199Hg, 207Pb, and 209Bi NMR spectroscopy. K.J. Harris, H. Hamaed, B.E.G. Lucier, A.W. MacGregor, A.J. Rossini and R.W. Schurko. 42nd Inorganic Discussion Weekend, Guelph, ON, Nov. 28-29, 2009, a poster by Kris Harris. 100. B.E.G. Lucier, J.-L. Lemyre, A.M. Ritcey and R.W. Schurko. Multinuclear Solid-State NMR of Octahedral YF3 Nanoparticles. MOOT XXII NMR Symposium, Ottawa, ON, October 17-18, 2009. A poster by Brian Lucier. 99. L.A. O扗ell, A.J. Rossini and R.W. Schurko. New Methods for Ultra-Wideline Solid-State NMR. 55th International Conference on Analytical Spectroscopy and Sciences, August 9-12, 2009, Kingston, ON, a talk presented by Rob Schurko. Invited lecture. 98. L.A. O扗ell and R.W. Schurko. New Applications of Phase-Modulated Pulses in Solid-State NMR of Quadrupolar Nuclei. 51st Rocky Mountain Conference on Analytical Chemistry, Breckenridge, CO, July 19-23, 2009, a talk presented by Luke O扗ell. 97. L.A. O扗ell and R.W. Schurko. Amplitude- and Phase-Modulated Excitation Pulses Generated Using Optimal Control in SIMPSON 2.0. 51st Rocky Mountain Conference on Analytical Chemistry, Breckenridge, CO, July 19-23, 2009, a poster presented by Luke O扗ell. 96. H. Hamaed, M.W Laschuk, V.V. Terskihk and R.W. Schurko. Application of Solid-State 209Bi NMR to the Structural Characterization of Bismuth-Containing Materials. 51st Rocky Mountain Conference on Analytical Chemistry, Breckenridge, CO, July 19-23, 2009, a poster presented by Hiyam Hamaed. 95.A.J. Rossini and R.W. Schurko. Characterization of Metallocene Based Olefin Polymerization Catalysts by Solid-State 91Zr and 35Cl NMR. 51st Rocky Mountain Conference on Analytical Chemistry, Breckenridge, CO, July 19-23, 2009, a poster presented by Aaron Rossini. 94. M.P. Hildebrand, A.J. Rossini, Paul Hazendonk and R.W. Schurko. Multinuclear Solid-State NMR Studies of Polymer Supported Scandium Based Catalysts. 51st Rocky Mountain Conference on Analytical Chemistry, Breckenridge, CO, July 19-23, 2009, a poster presented by Aaron Rossini. 93. H. Hamaed, M.W. Laschuk, V.V. Terskikh and R.W. Schurko. Application of Solid-State 209Bi NMR to the Structural Characterization of Bismuth-Containing Materials. 92nd Canadian Society for Chemistry Conference, Hamilton, ON, May 30 - June 2, 2009, a lecture presented by H. Hamaed. 92. L.A. O扗ell, A.J. Rossini and R.W. Schurko. New Applications of Phase-Modulated Pulses for Solid-State NMR of Quadrupolar Nuclei. 92nd Canadian Society for Chemistry Conference, Hamilton, ON, May 30 - June 2, 2009, a lecture presented by L.A. O扗ell. 91. B.E.G. Lucier, J.-L. Lemyre, A.M. Ritcey and R.W. Schurko. Multinuclear Solid-State NMR of Octahedral YF3 Nanoparticles. 92nd Canadian Society for Chemistry Conference, Hamilton, ON, May 30 - June 2, 2009, a poster presented by B.E.G. Lucier. 90. A.J. Rossini, I. Hung and R.W. Schurko. 91Zr and 35Cl Solid-State NMR Studies of Heterogeneous Catalyst Precursors. 92nd Canadian Society for Chemistry Conference, Hamilton, ON, May 30 - June 2, 2009, a poster presented by A.J. Rossini. 89. M.P. Hildebrand, A.J. Rossini, R.W. Schurko and P. Hazendonk. 45Sc Solid State NMR Studies of Polymer Supported Catalytic Systems. 92nd Canadian Society for Chemistry Conference, Hamilton, ON, May 30 - June 2, 2009, a poster presented by M.P. Hildebrand. 88. A.J. Rossini and R.W. Schurko. Characterization of Metallocenes by 91Zr and 35Cl Solid-State NMR. National Ultra-High Field NMR Facility for Solids 4th Annual NMR Workshop, Hamilton, ON, May 30, 2009, a lecture presented by A.J. Rossini. 87. L.A. O'Dell, A.J. Rossini and R.W. Schurko. QCPMG Using WURST Pulses for Faster Ultra-Wideline Solid-State NMR Spectra of Quadrupolar Nuclei. 50th Experimental NMR Conference, Pacific Grove, CA, March 29 - April 3, 2009, a talk presented by R.W. Schurko. 86. A.J. Rossini, I. Hung and R.W. Schurko. Solid-State NMR Studies of Heterogeneous Catalyst Precursors. Aaron J. Rossini, Ivan Hung and Robert W. Schurko. 41st Inorganic Discussion Weekend, Brock University, St. Catharines, Ontario, November 28-30, 2008, a poster by A.J. Rossini. 85. H. Hamaed, J.M. Pawlowski, R. Fu, B.F. Cooper, S. H. Eichhorn and R.W. Schurko. Applications of 35Cl Solid-State NMR Spectroscopy to Detect Polymorphism in Hydrochloride Anaesthetic Drugs. MOOT XXI NMR Symposium, Windsor, Ontario, October 3-5, 2008, a poster by H. Hamaed. 84. A.W. MacGregor, A.J. Rossini, J.A. Tang, G.G. Briand, A.S. Smith, G. Schatte, D. Sakellariou, and R.W. Schurko. Ultra-Wideline 207Pb NMR of Lead (II) Thiolates. MOOT XXI NMR Symposium, Windsor, ON, October 3-5, 2008. A poster by Alan MacGregor. 83. B.E.G. Lucier, R.W. Schurko, and J.V. Hanna. Solid-State 65Cu and 31P Spectroscopy of Bis(triphenylphosphine) Copper Series. MOOT XXI NMR Symposium, Windsor, ON, October 3-5, 2008. A poster by Brian Lucier. 82. A.J. Rossini, I. Hung, and R.W. Schurko. Solid-State NMR Studies of Heterogeneous Catalyst Precursors. MOOT XXI NMR Symposium, Windsor, ON, October 3-5, 2008. A poster by Aaron Rossini. 81. A.J. Rossini, I. Hung, R.W. Mills, G.A. Briscoe and R.W. Schurko. Solid-state 35Cl, 47/49Ti and 91Zr NMR Spectroscopy of Metallocenes Important in Heterogeneous Catalysis. 236th National Meeting and Exposition of the American Chemical Society, Philadelphia, PA, August 17-21, 2008. Invited lecture. 80. H. Hamaed, J.M. Pawlowski, R. Fu, B.F. Cooper, S.H. Eichhorn and R.W. Schurko. Application of Solid-State 35Cl NMR to the Structural Characterization of Hydrochloride Pharmaceuticals and their Polymorphs. 50th Rocky Mountain Conference on Analytical Chemistry, Breckenridge, CO, July 27-31, 2008, a lecture presented by Hiyam Hamaed. 79. A.W. MacGregor, A.J. Rossini, G. Briand, A.S. Smith, Gabrielle Schatte and R.W. Schurko. Ultra-Wideline 207Pb Solid-State NMR of Lead (II) Thiolates. 50th Rocky Mountain Conference on Analytical Chemistry, Breckenridge, CO, July 27-31, 2008, a poster presented by Alan MacGregor. 78. B.E.G. Lucier, J.V. Hanna and R.W. Schurko. Solid-State 65Cu and 31P NMR Spectroscopy of Bis-(triphenylphosphine) Copper Species. 50th Rocky Mountain Conference on Analytical Chemistry, Breckenridge, CO, July 27-31, 2008, a poster presented by Bryan Lucier. 77. R.W. Schurko, J.A. Tang, L.A. O'Dell, A.J. Rossini, H. Hamaed, A.Y.H. Lo and D. Sakellariou. A Survey of Ultra-Wideline Solid-State NMR Spectroscopy. 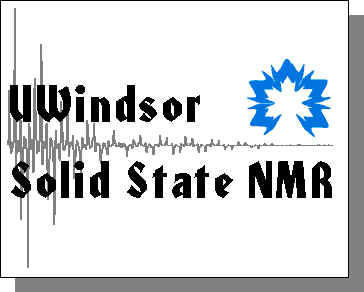 3rd Annual Solid-State NMR Workshop - NUhfNMRFS, Edmonton, AB - May 24, 2008. Invited lecture. 76. A.J. Rossini, R.W. Mills, G.A. Briscoe, E.L. Norton and R.W. Schurko. Solid-state 35Cl, 47/49Ti and 91Zr NMR Spectroscopy of Metallocenes Relevant in Heterogeneous Catalysis. 91st Conference of The Canadian Society for Chemistry, May 24-38, 2008, a lecture presented by R.W. Schurko. Invited lecture. 75. H. Hamaed, J.M. Pawlowski, R. Fu, B.F. Cooper, S.H. Eichhorn and R.W. Schurko. Applications of 35Cl Solid-State NMR Spectroscopy to Detect Polymorphism in Hydrochloride Anaesthetic Drugs. 49th Experimental NMR Conference, Pacific Grove, CA, March 9-14, 2008, a poster presented by R.W. Schurko. 74. K.K. Dey, J.T. Ash, N.M. Trease, P.J. Grandinetti and R.W. Schurko. Trading Information for Sensitivity: A Systematic Study of the CPMG Experiment in Solids. 49th Experimental NMR Conference, Pacific Grove, CA, March 9-14, 2008, a poster presented by P.J. Grandinetti. 73. A.J. Rossini, R.W. Mills, G.A. Briscoe, E.L. Norton and R.W. Schurko. 35Cl, 47/49Ti and 91Zr Solid-state NMR and Ab initio Studies of Early Transition Metal Heterogeneous Catalyst Precursors. 49th Experimental NMR Conference, Pacific Grove, CA, March 9-14, 2008, a poster presented by A.J. Rossini. 72. A.J. Rossini, R.W. Mills, G.A. Briscoe, E.L. Norton and R.W. Schurko. Solid-state 35Cl NMR Studies of Early Transition Metal Organometallic Complexes. Inorganic Discussion Weekend (IDW), University of Toronto, Toronto, ON, Canada, November 3-4, 2007, a poster presented by A. Rossini. 71. H. Hamaed, L.J. May, G.K.H. Shimizu and R.W. Schurko. A Multinuclear Solid-State NMR and Ab Initio Study of Silver Supramolecular Frameworks and Their Interactions with Primary Amines. 49th Rocky Mountain Conference on Analytical Chemistry, Breckenridge, CO, July 22-26, 2007, a poster presented by H. Hamaed. 70. J.A. Tang, E. Kogut, A.J. Lough, C.M. Widdifield, U. Fekl, and R.W. Schurko. A CS Tensor Investigation of Platinum Bisdithiolene Compounds by Mulitnuclear Solid-State NMR Spectroscopy. 49th Rocky Mountain Conference on Analytical Chemistry, Breckenridge, CO, July 22-26, 2007, a poster presented by J. Tang. 69. A.J. Rossini, G.A. Briscoe, R.W. Mills and R.W. Schurko. Wideline Solid-State Chlorine NMR Studies of Early Transition Metal Organometallic Complexes. 49th Rocky Mountain Conference on Analytical Chemistry, Breckenridge, CO, July 22-26, 2007, a poster presented by R.W. Schurko. 68. R.W. Schurko. Ultra-Wideline Solid-State NMR Spectroscopy. 1st International Symposium on NMR of Metals in Biological Systems and Materials, June 8-10, 2007, Newark, DE. Invited Lecture. 67. R.W. Schurko, A.Y.H. Lo, V. Sudarsan, S. Sivakumar and F. van Veggel. Multinuclear Solid-State NMR Spectroscopy of Doped Lanthanum Fluoride Nanoparticles. 90th Conference of The Canadian Society for Chemistry, May 28 - June 1, 2007, Winnipeg, Manitoba. Invited Lecture. 66. A.J. Rossini, G.A. Briscoe and R.W. Schurko. Solid-State Chlorine NMR of Organometallic Complexes. 90th Conference of The Canadian Society for Chemistry, May 28 - June 1, 2007, Winnipeg, Manitoba, a poster by Aaron Rossini. 65. J.A. Tang, E. Kogut, A.J. Lough, C.M. Widdifield, U. Fekl, and R.W. Schurko. Multinuclear Solid-State NMR of Platinum Mono- and Bisdithiolene Species. 90th Conference of The Canadian Society for Chemistry, May 28 - June 1, 2007, Winnipeg, Manitoba, a poster by Joel Tang. 64. A.J. Rossini, G.A. Briscoe, and R.W. Schurko. Inorganic Discussion Weekend (IDW), Carleton University, Ottawa, ON, October 27-29, 2006. Solid-State Chlorine NMR of Catalytically Important Organometallic Species, a poster by Aaron Rossini. 63. J.A. Tang, B.D. Ellis and R.W. Schurko. Inorganic Discussion Weekend (IDW), Carleton University, Ottawa, ON, October 27-29, 2006. Solid-State 63Cu and 65Cu NMR of Organometallic and Inorganic Copper(I) Complexes, a poster by J.A. Tang. 62. A.J. Rossini, G.A. Briscoe and R.W. Schurko. MOOT XIX NMR Symposium, Guelph, ON, September 23-24, 2006. Solid-State Chlorine NMR of Catalytically Important Organic Species, a poster by Aaron Rossini. 61. A. Sutrisno, A.Y.H. Lo, J.A..Tang, J.L. Dutton, P.J. Ragogna, R.T. Oakley, C.M. Robertson and R.W. Schurko. MOOT XIX NMR Symposium, Guelph, ON, September 23-24, 2006. Experimental and Theoritical Investigations of Selenium Chemical Shielding Tensors in Planar Heterocycles, a poster by Andre Sutrisno. 60. A.Y.H. Lo, S.L. Brock, I. Arachchige and R.W. Schurko. MOOT XIX NMR Symposium, Guelph, ON, September 23-24, 2006. Solid朣tate 111Cd, 77Se, 19F, 13C and 1H NMR Spectroscopy of CdSe Nanoparticle Aerogels and Xerogels, a poster by Andy Lo. 59. J.A. Tang, B.D. Ellis and R.W. Schurko. MOOT XIX NMR Symposium, Guelph, ON, September 23-24, 2006. Solid-State NMR of Organometallic and Inorganic Copper(I) Complexes, a poster by Joel Tang. 58. H. Hamaed, R.W. Schurko, D.S. Lee and William J. Evans. MOOT XIX NMR Symposium, Guelph, ON, September 23-24, 2006. 139La, 15N and 13C Solid-State NMR of Lanthanum Metallocenes, a poster by Hiyam Hamaed. 57. R.W. Schurko. Small Molecule NMR Conference (SMASH), September 10-13, 2006, Burlington, Vermont. Solid-State NMR of Metal Nuclei in Metallocenes. Invited lecture. 56. J.A. Tang, B.D. Ellis and R.W. Schurko. 48th Annual Rocky Mountain Conference on Analytical Chemistry July 23-27, 2006 Breckenridge, Colorado. Solid-State NMR of Organometallic and Inorganic Copper(I) Complexes, a poster by J.A. Tang. 55. A.J. Rossini, A. Iuga, P. Hazendonk and R.W. Schurko. 48th Annual Rocky Mountain Conference on Analytical Chemistry July 23-27, 2006 Breckenridge, Colorado. Solid-State 45Sc NMR Spectroscopy as a Structural Probe in Inorganic Materials, a poster by A.J. Rossini. 54. A.Y.H. Lo, S.L. Brock and R.W. Schurko. 48th Annual Rocky Mountain Conference on Analytical Chemistry July 23-27, 2006 Breckenridge, Colorado. Solid-state 111Cd, 77Se, 13C and 1H NMR of CdSe Nanoparticles in Xerogels and Aerogels, a poster by A.Y.H. Lo. 53. H. Hamaed, L.J. May, G.K. Shimizu and R.W. Schurko. 48th Annual Rocky Mountain Conference on Analytical Chemistry July 23-27, 2006 Breckenridge, Colorado. 109Ag and 15N Solid-State NMR of Silver Supramolecular Frameworks and Intercalates, a poster by H. Hamaed. 52. H. Hamaed, A.Y.H. Lo, D.S. Lee, W.J. Evans and R.W. Schurko. 48th Annual Rocky Mountain Conference on Analytical Chemistry July 23-27, 2006 Breckenridge, Colorado. Solid-State 139La and 15N NMR of Lanthanum Metallocenes, a poster by H. Hamaed. 51. R.W. Schurko, I. Hung, H. Hamaed, A.Y.H. Lo, A.J. Rossini, J. A. Tang and C.M. Widdifield. 18th Waterloo NMR Summer School, June 4-7, 2006, Waterloo, ON, Canada. Advances in Solid-State NMR of Organometallic Systems. Invited Lecture. 50. L.J. May, G.K. Shimizu, H. Hamaed and R.W. Schurko. 89th Conference of The Canadian Society for Chemistry, Halifax, NS, Canada, May 27-31, 2006. Selective Sorption of Lewis Bases by a Weakly Bonded Coordination Solid, a poster by L.J. May. 49. R.W. Schurko, Ivan Hung, Hiyam Hamaed, Andy Y.H. Lo, Aaron J. Rossini, Joel A. Tang and Cory M. Widdifield. 47th ENC Conference, Asilomar Conference Center, Pacific Grove, CA. April 23 - 28, 2006. Application of Solid-State NMR to the Study of Metal Nuclei in Organometallic Systems. Invited Lecture. 48. A.J. Rossini and R.W. Schurko, 38th IDW, University of Western Ontario, London, ON, Nov 4th-6th, 2005. 45Sc Solid-State NMR of Coordination Complexes and Lewis Acid Catalysts, a poster by A.J. Rossini, poster prize. 47. C.M. Widdifield and R.W. Schurko. MOOT XVIII NMR symposium, McMaster University, Hamilton, ON, October 14-16, 2005. A Description of NMR Chemical Shielding Tensors utilizing the ADF Computational Software Package and Subsequent MO Analysis, a poster by C.M. Widdifield. 46. H. Hamaed, A.Y.H. Lo, L.J. May, G.K.H. Shimizu and R.W. Schurko. MOOT XVIII NMR symposium, McMaster University, Hamilton, ON, October 14-16, 2005. Solid-State 109Ag NMR of Silver Supramolecular Frameworks, a poster by H. Hamaed. 45. J.A. Tang, B.D. Ellis and R.W. Schurko, MOOT XVIII NMR symposium, McMaster University, Hamilton, ON, October 14-16, 2005.. Solid-Sate NMR of Copper(I) Phosphines, a poster by J.A. Tang. 44. A.Y.H. Lo, Frank C.J.M. van Veggel, V. Sudaran and R.W. Schurko. MOOT XVIII NMR symposium, McMaster University, Hamilton, ON, October 14-16, 2005.. Solid-state 139La, 19F, 31P, 89Y, and 1H NMR Study of LaF3 Composites Nanoparticles, a talk by A.Y.H. Lo. 43. A.J. Rossini and R.W. Schurko. MOOT XVIII NMR symposium, McMaster University, Hamilton, ON, October 14-16, 2005. Application of 45Sc Solid-State NMR to Scandium Containing Compounds and Materials, a talk by A.J. Rossini. 42. H. Hamaed, D.S. Lee, W.J. Evans and R.W. Schurko. 47th Rocky Mountain Conference on Analytical Chemistry, July 31-August 4, 2005, Denver, CO. Solid-State 139La, 89Y and 15N NMR of Metallocenes, a poster presented by R.W. Schurko. 41. A.J. Rossini and R.W. Schurko. 47th Rocky Mountain Conference on Analytical Chemistry, July 31-August 4, 2005, Denver, CO. 45Sc Solid-State NMR of Coordination Compounds and Application to Lewis Acid Catalysts, a poster presented by R.W. Schurko. 40. R.W. Schurko, H. Hamaed, I. Hung, A.Y.H. Lo, A.J. Rossini, J.A. Tang and C.M. Widdifield. 88th Conference of The Canadian Society for Chemistry, May 28 - June 1, 2005, Saskatoon, Saskatchewan. NMR Tensors of Metal Nuclei: Applications in Organometallic, Materials and Supramolecular Chemistry, a talk by R.W. Schurko, Invited Lecture. 39. J.A. Tang, J.D. Masuda and R.W. Schurko. 88th Conference of The Canadian Society for Chemistry, May 28 - June 1, 2005, Saskatoon, Saskatchewan. Solid-State 27Al NMR of Three- and Five-Coordinate Aluminum Species, a poster presented by J.A. Tang. 38. L.J. May, G.K.H. Shimizu, H. Hamaed and R.W. Schurko. 88th Conference of The Canadian Society for Chemistry, May 28 - June 1, 2005, Saskatoon, Saskatchewan. Selective Separating and Sensing Properties of Layered Coordination Solids: Structures, Properties and 109Ag NMR, a poster presented by L.J. May. 37. A.J. Rossini, R.W. Schurko, K. Conroy and W.E. Piers. 88th Conference of The Canadian Society for Chemistry, May 28 - June 1, 2005, Saskatoon, Saskatchewan. Applications of Solid-State 45Sc NMR to Coordination Complexes, Metallocenes and Lewis-Acid Catalysts, a poster presented by A.J. Rossini. 36. H. Hamaed H., R.W. Schurko, D.S. Lee and W.J. Evans. 88th Conference of The Canadian Society for Chemistry, May 28 - June 1, 2005, Saskatoon, Saskatchewan. 139La and 89Y Solid-State NMR of Sterically-Crowded Metallocenes, a poster presented by H. Hamaed. 35. J.A. Tang and R.W. Schurko. MOOT XVII NMR symposium, Sept. 25-26, 2004, Kingston, Ontario. Solid State NMR of Vanadia-Supported Metal Oxide Nanoparticles, a poster presented by J.A. Tang. 34. J.A. Tang, J.D. Masuda and R.W. Schurko. 46th Rocky Mountain Conference on Analytical Chemistry, August 1-5, 2004, Denver, CO, USA. Ultra-wideline NMR Spectra of Quadrupolar Nuclei, a poster presented by J.A. Tang. 33. A.Y.H. Lo, R.W. Schurko, V. Sudarsan and F.C.J.M. van Veggel. 46th Rocky Mountain Conference on Analytical Chemistry, August 1-5, 2004, Denver, CO, USA. Solid-state 139La and 19F NMR of Lanthanide-Doped LaF3 Nanoparticles, a poster presented by A.Y.H. Lo. Laura Marinelli Prize (top poster) awarded to A.Y.H. Lo. 32. I. Hung and R.W. Schurko. 46th Rocky Mountain Conference on Analytical Chemistry, August 1-5, 2004, Denver, CO, USA. A Survey of Zirconocene-Based Catalyst Precursors in the Solid State by 91Zr NMR, a poster presented by I. Hung. Poster award, 2nd place, NMR session, awarded to I. Hung. 31. C.M. Widdifield and R.W. Schurko. 46th Rocky Mountain Conference on Analytical Chemistry, August 1-5, 2004, Denver, CO, USA. 13C and 39K NMR Study of the Potassium Metallocenes CpK and Cp*K," a poster presented by C.M. Widdifield. Poster award, 1st place, NMR session, awarded to C. Widdifield. 30. R.W. Schurko, I. Hung , A.Y.H. Lo, C.M. Widdifield and J.A. Tang. 87th Conference of The Canadian Society for Chemistry, May 29 - June 1, 2004, London, Ontario. Solid-State NMR Studies of Metal Quadrupolar Nuclei in Metallocenes, a talk presented by R.W. Schurko. 29. A.Y.H. Lo, B. Skadtchenko, D.M. Antonelli and R.W. Schurko. 87th Conference of The Canadian Society for Chemistry, May 29 - June 1, 2004, London, Ontario. Solid-state 87Rb and 13C NMR Study of Rubidium Fulleride and Mesoporous Tantalum Oxide Composites, a poster present by A.Y.H. Lo. 28. I. Hung and R.W. Schurko. 87th Conference of The Canadian Society for Chemistry, May 29 - June 1, 2004, London, Ontario. A Survey of Zirconocene-Based Catalyst Precursors in the Solid State by 91Zr NMR, a poster presented by I. Hung. 27. C.M. Widdifield and R.W. Schurko. 87th Conference of The Canadian Society for Chemistry, May 29 - June 1, 2004, London, Ontario. 13C and 39K NMR Study of the Potassium Metallocenes CpK and Cp*K," a poster presented by C.M. Widdifield. 26. C.M. Widdifield and R.W. Schurko. Southern Ontario Undergraduate Student Chemistry Conference, Trent University, Peterborough, Ontario, March 20, 2004. 13C and 39K Solid-State NMR Experiments on the Potassium Metallocenes CpK and Cp*K, a talk present by C.M. Widdifield. 25. R.W. Schurko, I. Hung, C.M. Widdifield, A.Y.H. Lo and A.J. Rossini. The 39th IUPAC Congress and 86th Conference of The Canadian Society for Chemistry, August 10 - 15, 2003, Ottawa, Ontario, Canada. Signal Enhancement Techniques for Unreceptive Half-Integer Quadrupolar Nuclei, a talk presented by R.W. Schurko. 24. A.Y.H. Lo and R.W. Schurko. The 39th IUPAC Congress and 86th Conference of The Canadian Society for Chemistry, August 10 - 15, 2003, Ottawa, Ontario, Canada. Solid-State 93Nb NMR Studies of Piano-Stool Cyclopentadienyl Niobium Derivatives, a poster by A.Y.H. Lo. 23. I. Hung and R.W. Schurko. The 39th IUPAC Congress and 86th Conference of The Canadian Society for Chemistry, August 10 - 15, 2003, Ottawa, Ontario, Canada. Structure and Dynamics in the Beryllocene 'Slip-Sandwich' by Solid-State 9Be and 13C NMR, a poster by I. Hung. 22. R.W. Schurko, I. Hung and M.J. Willans. 44th Rocky Mountain Conference on Analytical Chemistry - NMR Symposium, July 28 - August 1, 2002, Denver, CO, USA. Solid-State NMR of Half-Integer Quadrupolar Nuclei in Alkali and Alkali Earth Metal Metallocenes, poster by R.W. Schurko. 21. I. Hung and R.W. Schurko. 44th Rocky Mountain Conference on Analytical Chemistry - NMR Symposium, July 28 - August 1, 2002, Denver, CO, USA. Solid State 91Zr NMR Study of Organometallic and Inorganic Zirconium Compounds, poster by I. Hung. 20. A.Y.H. Lo and R.W. Schurko. 44th Rocky Mountain Conference on Analytical Chemistry - NMR Symposium, July 28 - August 1, 2002, Denver, CO, USA. Theoretical Prediction of 51V Quadrupolar Parameters in Vanadates. 19. R.W. Schurko, I, Hung, A.Y.H. Lo and M.J. Willans. 34th Regional Central Meeting of the American Chemical Society, June 25 - 28, 2002, Ypsilanti, MI, USA. Solid-State NMR of Unreceptive Quadrupolar Nuclei, a talk by R.W. Schurko, Invited Lecture. 18. I. Hung and R.W. Schurko. 34th Regional Central Meeting of the American Chemical Society, June 25 - 28, 2002, Ypsilanti, MI, USA. Efficient Acquisition of Wideline 91Zr NMR Spectra in the Solid State, poster by Ivan Hung. 17. A.Y.H. Lo and R.W. Schurko. 34th Regional Central Meeting of the American Chemical Society, June 25 - 28, 2002, Ypsilanti, MI, USA. Theoretical Prediction of 51V Quadrupolar Parameters in Vanadates. 16. M.J. Willans, I.Hung and R.W. Schurko. 34th Regional Central Meeting of the American Chemical Society, June 25 - 28, 2002, Ypsilanti, MI, USA. Probing the Structure and Dynamics of Polymeric Sodoocenes: A Multinuclear Solid-State NMR Study. 15. B. Skadtchenko, M.J. Trudeau, M.J. Willans, R.W. Schurko and D.M. Antonelli. 85th CSC Conference, June 2-6, 2002, Variable-Temperature Electron Transport, Magnetic and 23Na NMR Studies on Mesoporous Ta Oxide Na Fulleride Composites, talk by B. Skadtchenko. 14. R.W. Schurko, I. Hung, A.Y.H. Lo and M. Willans. 48th International Conference on Analytical Sciences and Spectroscopy, Enviroanalysis 2002. Toronto, Ontario. May 30, 2002. Solid State NMR of Quadrupolar Nuclei in Main Group & Transition Metal Metallocenes, talk by R.W. Schurko, Invited Lecture. 13. M.J. Willans and R.W. Schurko. 30th Southwestern Ontario Undergraduate Student Chemistry Conference. Ryerson University, Toronto, Ontario. March 23, 2002. Solid-State NMR Study of the Structure and Dynamics of Sodium Metallocenes, talk by M.J. Willans. 12. S. Wi, R.W. Schurko and L. Frydman. 2nd Alpine Conference on Solid-State NMR, September 9-13, 2001, Chamonix-Mont Blanc, France. Higher Order Effects in the Solid State NMR of Quadrupolar Nuclei, talk by L. Frydman. 11. R.W. Schurko, I. Hung, C.L.B. Macdonald, A.H. Cowley. 43rd Rocky Mountain Conference - NMR Symposium, July 30 - August 2, 2001, Denver, CO, USA. Anisotropic NMR Interactions in a Symmetric Main Group Metallocene, poster by R. Schurko. 10. R.W. Schurko, I. Hung, S. Schauff, C.L.B. Macdonald, A.H. Cowley. 43rd Rocky Mountain Conference - NMR Symposium, July 30 - August 2, 2001, Denver, CO, USA. Boron-11 NMR as a Probe of Structure and Dynamics in Solid Organoboron Complexes, poster by Ivan Hung (graduate student). 9. R.W. Schurko, I. Hung and S. Schauff. Waterloo Summer School, June 10 - 16, 2001, Waterloo, ON. Experimental and Theoretical NMR Study of Boron Metallocene Structure and Dynamics, poster by Ivan Hung (graduate student). 7. S. Schauff, R.W. Schurko, C.L.B. Macdonald and A.H. Cowley. 29th Southwestern Ontario Undergraduate Student Chemistry Conference. University of Toronto at Scarborough, Scarborough, Ontario. March 24, 2001. Probing Metallocene Structure Via the Metal Centre: Solid-State 23Na NMR and Ab Initio Study of Sodocenes, poster by S. Schauff.